BOULDER, Colo. — Pythons are known for their enormous appetites. In a single meal they can devour animals at least as big as they are — deer, alligators, pigs, household pets. Equally remarkable is what happens inside the python as it digests its prey. Within a day, its internal organs can double in size. Metabolic rate and production of insulin and lipids soar. Then, like an accordion, the python’s organs return to normal size in just a few days. Metabolism slows. Then the snake can fast for months, even a year, without losing muscle mass or showing any ill effects, ready to ambush new prey. How this process happens so rapidly is a biological mystery with important implications for human health, particularly when it comes to heart failure. Now scientists at the University of Colorado are reporting that they have partly solved it. A second finding is that a specific combination of three fatty acids produces enlargement of a python’s heart, intestines, liver and kidneys. Injections of the combination produce similar growth in the heart of a mouse. A giant python swallows an alligator in Everglades National Park, Fla.
Understanding such exaggerated variations, the researchers say, could help them develop novel ways to delay, prevent, treat or even reverse various hereditary and acquired human diseases. Substances from other reptiles have been used to develop drugs; for example, the diabetes drug Byetta is derived from a hormone found in Gila monster saliva. And the day may come when doctors literally prescribe snake oil for heart disease. “Heart failure is the goal” of the python research, said Leslie A. Leinwand, a Howard Hughes Medical Institute professor at the University of Colorado and a senior member of the research team. She added that the findings might also lead to treatments to prevent sudden death in young athletes, as well as ailments like diabetes, high blood pressure and obesity. 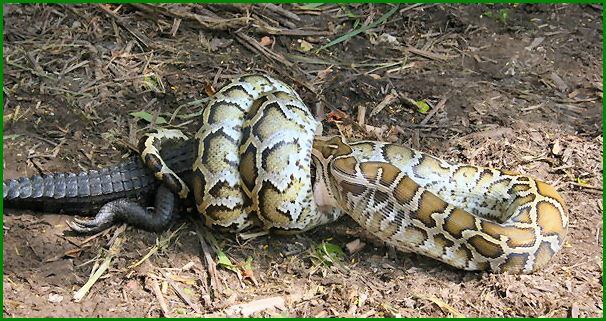 A gorging python produces an opaque milky plasma composed of fatty acids and other lipids in amounts that would damage a human heart, Dr. Leinwand said. Trigylcerides, the main components of natural fats and oils, zoomed to 50 times the fasting rate. Dr. Leinwand had been fascinated by a journal article by Stephen M. Secor and Jared Diamond urging other scientists to explore extremes of lifestyles among wild animals. The python research in Boulder began in 2005, when Cecilia A. Riquelme, who had earned a Ph.D. in cell biology in her native Chile, sought a fellowship in Dr. Leinwand’s laboratory. An expert in the molecular workings of the heart, Dr. Leinwand knew little such research had been done on pythons. There are structural differences — a python heart has three chambers, a human heart four. Yet she thought experiments in comparative biology might advance human heart research. Pythons are not venomous; still, she feared being bitten. But the challenge was too tempting to pass up, and after a harmless bite she overcame her fear. 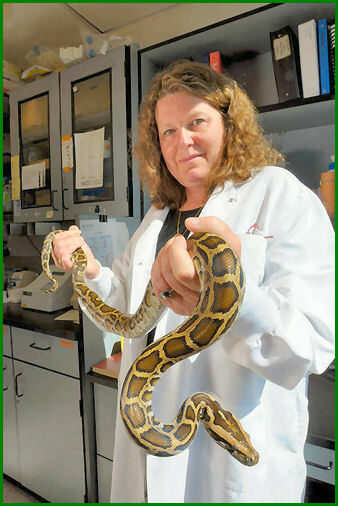 She started by observing how the python’s organs grew while the intact prey was in the stomach. The organs regressed in size over about two weeks. Using chemical stains they developed to measure cell size and the number of nuclei, the investigators determined that the heart expansion was from hypertrophy, not formation of new cells. Hypertrophy of the human heart occurs in two types. One, from ailments like high blood pressure and heart attacks, is a leading predictor of death. The second type is beneficial and occurs from exercise in conditioned athletes. The Colorado scientists found that the enlargement of a python’s heart is analogous to the growth seen in the heart of a human athlete. Among their goals is to better understand how plasma components instruct individual cells to develop into the beneficial ones among athletes or bad ones in disease. After a year, Dr. Riquelme determined that she could enlarge the heart of a starved python by injecting blood from a feasting one. She then proposed adding the blood’s straw-colored plasma to rat heart cells to determine whether it had the same effect. Still, a major mystery remained: What component of the python plasma caused the cells to enlarge? Dr. Riquelme used gas chromatography and additional techniques to analyze the proteins, lipids and other components of python plasma in fed and starving pythons. Several pieces of evidence pointed to fatty acids, which are important in the body’s energy production and metabolism. In additional experiments, Dr. Riquelme and other members of the Colorado team found that only the specific combination of three fatty acids from a sated python produced the same hypertrophy when injected into a fasting one. The three fatty acids that enlarge the python’s cells (myristic, palmitic and palmitoleic) occur in proportionately higher amounts in pythons than in humans. Injections of one fatty acid, or a combination of two, did not produce hypertrophy. 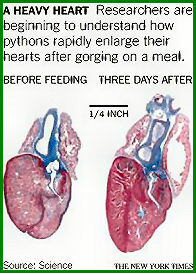 Another mystery was what protected the python heart from the toxic effects of huge amounts of the lipids. Further research determined that the protective substance was an enzyme, SOD (for superoxide dismutase), an antioxidant that defends cells exposed to oxygen. Eventually Dr. Riquelme returned with her family to Chile (though their departure was delayed for months by the giant earthquake in February 2010), and it was left to her colleagues in Colorado to carry out additional experiments. In one, blood plasma from bloated pythons was injected into live mice. Again, surprisingly, mouse heart cells enlarged as they would in a well-conditioned athlete. Along the way, the Colorado team asked Dr. Secor, now at the University of Alabama in Tuscaloosa, to join in the research. He is an author of the new paper in Science. The findings leave a number of mysteries still open. What causes the organs to shrink to their fasting size? How would such findings apply to the death of human cells? And will repeated injections of the fatty acid combination safely lead to sustained increase in organ size? Dr. Leinwand said she carried out the python research with support from federal and Colorado taxpayers and the American Heart Association. But the federal National Institutes of Health rejected her requests for direct financing, calling the relationship between reptiles and human heart disease too remote. In 2007, Dr. Leinwand became a founder of the Hiberna Corporation of Boulder to develop drugs derived from the study of exaggerated variations in animal metabolism. The company helped pay for some of the research.